Point of Care Ultrasound (POCUS) is becoming increasingly prevalent in Emergency Departments (EDs) for diagnostic, procedural, and management purposes. In this post, we will examine some less known, but extremely useful, indications for POCUS. 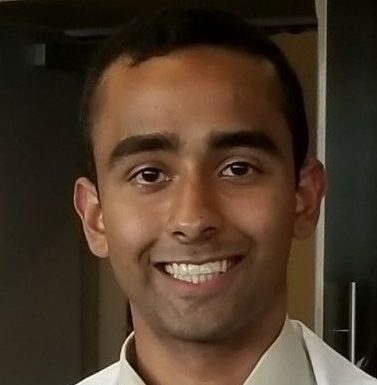 For further information, please visit our POCUS archives and see Dr. Rajiv Thavanathan’s previous Grand Rounds post. These archives include posts highlighting the role of POCUS in soft tissue infections, delirium, undifferentiated shock, cardiogenic shock, venous thromboembolism, acute pulmonary edema, post-cardiac surgery, and in differentiating causes of pleuritic chest pain. Additionally, POCUS is still in its infancy from an EBM perspective; it is challenging to study and difficult to demonstrate a benefit with patient-centered outcomes. Most of the evidence discussed here will be observational with small sample sizes. But, this is the best evidence currently available. Finally, POCUS should always be used within the clinical context and pre-test probability of the clinical entity you are concerned about. 56M presents to the ED with a 1 day of nausea, vomiting, abdominal pain, decreased bowel movements, and a distended abdomen. He has a history of bowel obstructions secondary to previous surgeries, and has also had 10 CT scans of his abdomen in the last year for chronic pain. His assessment is otherwise normal, but he, unfortunately, continues to vomit despite IV antiemetics. You are concerned for a bowel obstruction. In this case, CT remains the gold standard, with most studies quoting a sensitivity of 92-94% for SBO. Additionally, CT can detect the cause of the SBO as well as assess for ischemic changes and other causes for abdominal pain. However, the cost, availability, and radiation dose can limit its usefulness for recurrent SBO. What about just ordering an AXR as a screening test? If it’s positive, we’ll call surgery, and they can decide if a CT is necessary. Sounds appealing, however, the test characteristics of AXR for SBO are quite poor. A study by Shrake in the American Journal of Gastroenterology showed a sensitivity of 70% and specificity of 55%. A review article looking at the evidence for AXR in various abdominal complaints found that, “Plain abdominal radiographic findings have been shown to be indifferent in 20-30% of cases and misleading in 10-20% of patients” and that after the AXR, the level of confidence in the diagnosis remained unchanged in (52%). These statistics are also quoted in Rosen’s. Therefore, half of the time an AXR will not help you and up to a fifth of the time it can actually mislead you. Most patients with recurrent SBO do not require surgery. Theoretically, if a rapid test could diagnose SBO with accuracy similar to CT in stable patients with normal vitals, labs, and a highly suggestive cause for SBO (i.e. recurrent SBOs secondary to adhesions), these patients could undergo a trial of conservative therapy without CT imaging (as CT would only add the cause of SBO and is more accurate for ischemic changes). This is where ultrasound comes in, however, worsening clinical status, concern for the cause of obstruction, and concern for ischemia or perforation should prompt CT imaging. You want to cover all 4 quadrants of the abdomen divided in an “X” from the umbilicus (epigastrium, right and left paracolic gutters, and suprapubically). Here are a few more examples of positive scans. 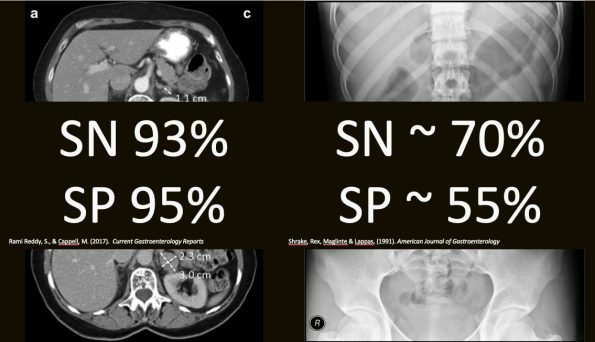 A 2018 review article looked at the test characteristics of formal radiology performed US for the diagnosis of SBO. They found a sensitivity of 94% and a specificity of 91%. Comparing those to CT and AXR, this is encouraging. However, many of their US protocols are much more comprehensive than what we would perform in the ED. Ünlüer et al. trained 4 third-year EM residents using a 3 hour didactic and practical session to diagnose SBO using POCUS. They compared EM POCUS, Radiology US, and AXR to their gold standard which was CT, surgery, or benign clinical course at 1-month telephone follow-up. They found great test characteristics for both bedside US and radiology performed US and, importantly, similar test characteristics between the two. They both looked even better when compared to AXR. They concluded that POCUS by EM residents is highly accurate for SBO even with minimal training. However, they used different cutoffs depending on whether you were looking at the jejunum or ileum and included looking for collapsed bowel distally. We believe this could be simplified. Jang et al. compared US and AXR to CT imaging for SBO. They used the two-quadrant protocol listed above. They found that the finding of decreased peristalsis was quite specific but had abysmal sensitivity. The finding of dilated bowel loops had good sensitivity and specificity. However, to optimize sensitivity, they found it best to use both findings. Compared with AXR, test characteristics look significantly better. They concluded that EP-performed US compares favorably to AXR and appears to be a reasonable alternative to AXR as the initial imaging modality in suspected SBO. A 2013 systematic review and meta-analysis in Academic Emergency Medicine set out with the ambitious goal of summarizing all the available evidence for the assessment of SBO including history, physical, and imaging. For the AXR, they included 6 studies including the Jang et al. study and found a summary estimate of SN 75%, SP 66%. For POCUS, they included the Ünlüer et al. and Jang et al. studies and found a summary estimate of SN 97% and SP 90%. Arguably the best evidence for POCUS diagnosis of SBO comes from a 2018 systematic review and meta-analysis. They looked at 11 studies encompassing 10 different countries and over 1100 patients. Unfortunately, only 3 studies had the scans performed by Emergency Physicians with Radiologists doing the bulk of the scanning. Additionally, every study was observational and used different protocols and gold standards. Looking at the Forest plot below you can see an overall SN of 92% and SP of 97%. Encouragingly, when they looked at the EP performed studies highlighted here in red, the numbers did not change much. Their conclusion: the existing literature suggests that US is a valuable tool in the diagnosis of SBO with a sensitivity and specificity comparable to CT. So putting it all together, based on the data we have, we can see that POCUS has fairly decent numbers for the diagnosis of SBO and is certainly more accurate than AXR. This has to be interpreted with a grain of salt, however. Most of these studies were small, observational, and had relatively experienced operators. We imagine the true test characteristics sit somewhere in the low 90s to high 80s for both SN and SP. The accuracy will be even lower for a novice user. Encouragingly, the scan is very easy to learn; most people pick it up after around 1 or 2 practice scans. With that in mind, what should you be aware of if you plan to use this scan? POCUS likely won’t tell you the cause for the obstruction. In first-time presentations or if you are unsure of the cause, it is better to get a CT. While there are some signs of ischemia you can see on ultrasound, these would be outside the scope of most providers. If you’re worried about ischemia, do not delay the CT/consultation to POCUS the abdomen. Use your pre-test probability! Despite a negative POCUS if you are still concerned, get the CT as you would with a negative AXR. 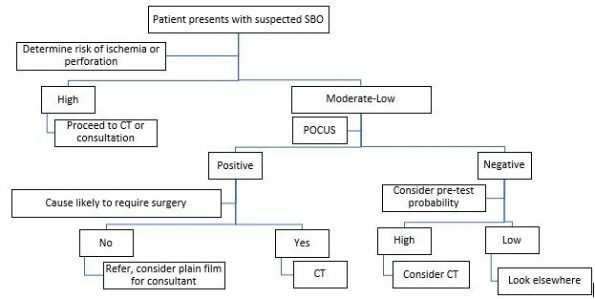 Here is how we recommend you use POCUS for SBO using a three-step decision tree. The traditional, palpation-based technique is not always successful and can add to patient discomfort and anxiety. This is more significant for patients with obesity, scoliosis, previous back surgery, or just difficult to palpate landmarks. Repeated LP attempts and deep needle insertions have been shown to increase the rate of post-dural puncture headaches, traumatic taps, back pain, and injury to deeper structures including nerve roots. Additionally, it can be theorized that increased local trauma and prolonged procedure times could potentially increase the rate of spinal hematoma and local infection including meningitis and spinal epidural abscesses. A common solution is to request fluoroscopically guided LP but this involves increased cost, is not always available, involves extra radiation, and increases length of stay. So is there a way US can help you here? Numerous methods have been described for the use of ultrasound to facilitate LP. The most widespread and accepted is the US assisted technique. The key word is “assisted” rather than “guided”. Compared to a central venous catheter insertion where you watch the needle enter the vessel, here you landmark your site of entry and mark it with a cross (similar to a paracentesis). The probe then goes away, and you perform the procedure as you usually would. You use the linear or curvilinear probe depending on patient size. You have two overarching goals which are the same as the palpation-based technique, though now you are using US to do it visually. These are (1) find the midline and (2) find the intervertebral space. Practically, how is this achieved? Position your patient recumbent or sitting. Start in the transverse plane. Place the probe where you estimate the L4-L5 space would be. 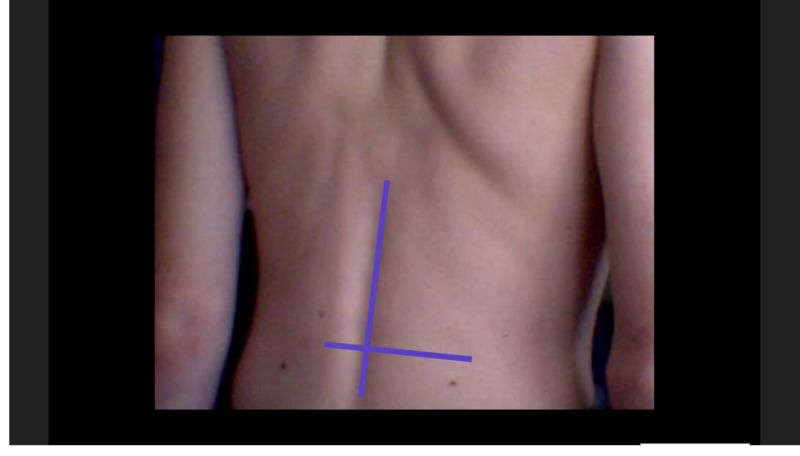 Your goal is to identify the midline by locating the spinous processes. In image C below; the asterisk denotes the spinous process (SP), and you can see it as a pointed hyperechoic peaked structure with a shadow behind it. Additionally, you can see that all the musculature comes to a point at that space. This denotes the true midline. You can mark one or two SPs on either side of the probe. If you are in between SPs (image E of the image below), you can see the articular facets which are sometimes referred to as the bat sign. You can also appreciate the interspinous ligament. It differs from the SPs as it has no posterior shadowing. Once you have located the midline and marked it, locate the intervertebral space by turning your probe into the longitudinal plane and sliding your probe inferiorly/superiorly until the image below is generated. The two structures marked with asterisks are again the SPs seen in the longitudinal plane, and the space between them is the intervertebral space. In 2005, Peterson et al. described a case series of two cases where US was used as a rescue technique for 2 difficult LPs in the Emergency Department. One in an obese patient with headache suggestive of SAH and the second in a febrile patient who had had a seizure. In light of these successes, they set out to complete an RCT on the topic which will be discussed later. Again, in the early 2000s, three separate studies by Whitty et al., Stiffler et al., and Furness et al. set out to determine if US could appropriately find the landmarks needed for LP. Whitty et al. compared US estimation of interspace level compared to palpation level in women undergoing epidural placement for labor and delivery. They found that there was about 55% agreement between US level and palpation level. 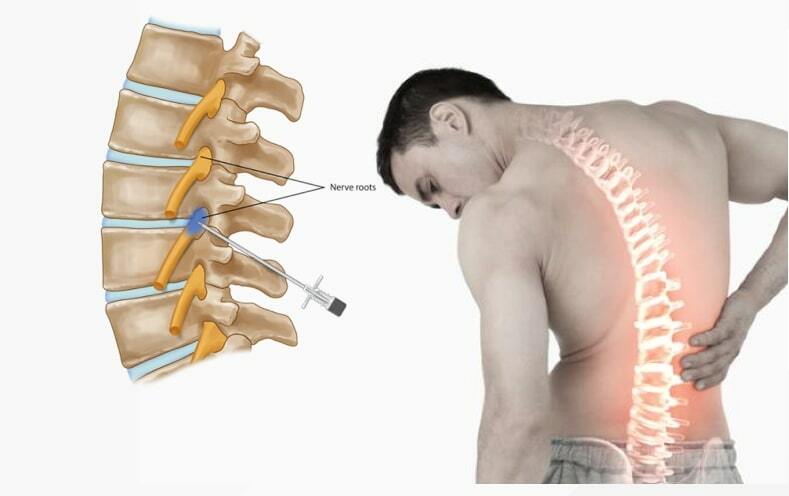 In the group where there was disagreement between the two modalities, they found that most of the time, the physicians were placing the needle higher than they expected. This is concerning as the conus starts around L2-L3. Stiffler et al. looked at patients with a range of BMIs and attempted to locate landmarks for LP via palpation and US. They found that 68% of patients with BMI over or equal to 30 had difficult to palpate landmarks. Fortunately, in 76% of those deemed “difficult” US was able to localize all landmarks confidently. When looking at correctly identifying ANY interspace (i.e. not placing the marker on a SP) US was 81.4% while palpation was 72% with 5 spaces that could not be marked by palpation. That’s great, but what we really care about is whether using US translates into a better ability to hit the spot you want. Will it help me get CSF more accurately? In 2011, Chin et al. at Toronto Western completed a prospective, unblinded RCT looking at the use of US compared to surface landmarks for induction of spinal anesthesia in 120 patients undergoing elective orthopedic procedures. All patients were deemed to be “difficult” by way of obesity (BMI over 35), poorly palpable landmarks, scoliosis, or previous lumbar surgery. There are some limitations to this paper, including that it was stopped early by an unplanned interim analysis. However, it showed that US in the hands of an anesthesiologist significantly improved their first attempt success in difficult patients. Again, this is great, Anesthesiologists can accurately use US to perform spinals but can I, a humble Emergency Doc, also use it? When looking at things like traumatic tap rate, Mofidi et al. completed a prospective RCT of 80 patients in 2013. They used a PGY3 as LP operator after 2 hours of US training. Again, they compared US vs. palpation. Each arm had a 100% LP success rate so they couldn’t compare success rates between the two modalities. But, they found a reduction in the rate of traumatic taps with US around 12.5% and palpation around 45%. 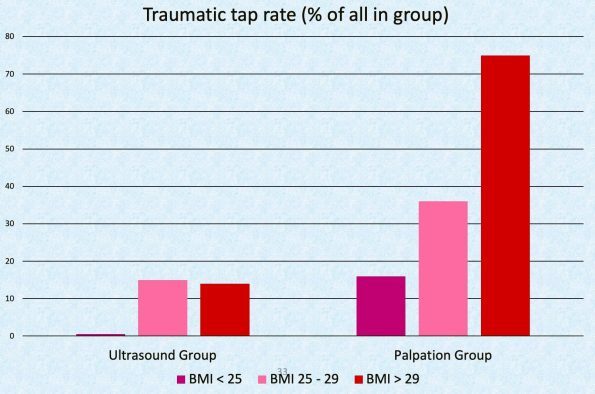 Interestingly, they also found that this trend towards reduced traumatic taps amplified as BMI went up. The two largest and most recent trials were done in the US in the last 5 years. These were done by Lahham et al. and Peterson et al.. The Lahham trial was a prospective RCT comparing US to palpation in 158 patients. The Peterson trial looked at 100 patients randomized similarly. They both looked at multiple primary outcomes, but most importantly looked at success, number of attempts, and traumatic taps. Surprisingly, they both found no difference in any outcomes. 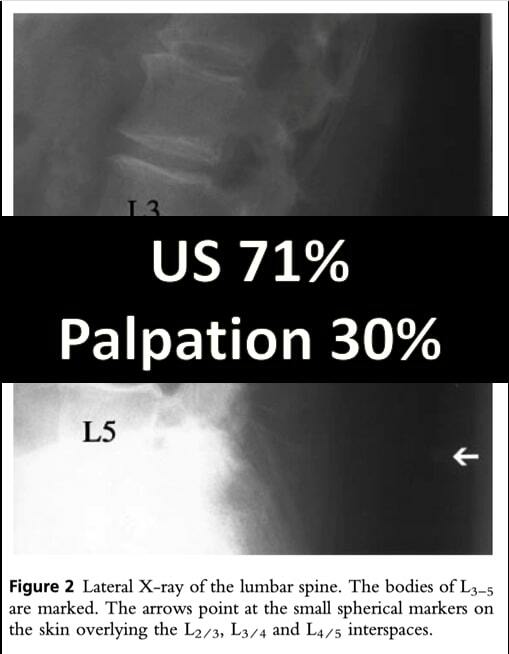 However, in the Peterson trial, they looked at a subgroup of patients with difficult to palpate landmarks and found a 15% increased LP success rate with US. Unfortunately, the study was not powered to detect this difference and therefore is only hypothesis generating. These studies were limited. In the Lahham trial, there were more obese patients in the US group and both were not blinded. Additionally, both used US on all enrolled patients. The biggest limitation of the Peterson trial is their US teaching method. LP operators who were residents were trained in the POCUS exam at the time of patient enrollment. So when they found someone that needed an LP, the study investigator would show up and show the operator how to do the scan while demonstrating on another part of the spine. The resident then had to re-do the exam on their own to get the LP. The conclusion of both of these studies was that the routine use of POCUS does not assist in performing an LP. So why are we talking about it then? It’s great that EPs can do it, but if it’s no better than the palpation-based approach, then why bother with the US? The study to back this up is the study by Nomura et al. in 2007, which is arguably the best study methodologically on the topic. This was a prospective, randomized, double-blind trial comparing US vs landmarking by palpation. Unfortunately, they only enrolled 46 patients. Investigator left, LP operator palpated and marked a separate site with an invisible ink pen as well. They looked at the number of attempts, ease of performance, comfort, time, success, and traumatic LPs. They found that success was more likely in the US group. However, they found no difference in the other outcome measures. The key difference between this study and the Peterson/Lahham studies is “experience of operators.” Here we have a trained EP with experience in US compared to a PGY1 being taught the scan 2 minutes before completing it. At the end of the day, POCUS-assisted LP seems to be indicated only in one or two scenarios. Presumed difficult LP and you have the experience to be successful. How do you get that experience? Get out and do it! 16-month old male presents with the below skin infection; you are unsure whether there is an abscess present or not. Using the linear probe, slide the probe across the affected area of skin. Here is what an abscess can look like. It appears as a spherical, fluid-filled structure with irregular borders. However, abscesses can also have an isoechoic appearance. This means that they are the same echotexture or “color” as the surrounding tissue. The key to differentiating these from normal cellulitis will be the presence of fluid moving within the cavity or a positive “squish” sign. If you put color on it, you will usually see hyperemia around the borders. This should not be confused with a vessel as the flow is not typically pulsatile. In 2016, a systematic review and meta-analysis in Academic Emergency Medicine looked at 6 prospective, observational trials encompassing 800 patients with the aim of determining the test characteristics of POCUS for an abscess. They included 4 adult trials and 2 pediatric trials. They excluded any trials looking at intra-oral abscess or abscesses requiring treatment in the OR. All trials were prospective observational and included a reference standard of positive I+D or resolution of SSTI on clinical follow-up. Most trials compared US vs. clinical exam (CE), however, one looked at CE vs. CE plus POCUS. They found that the sensitivity of POCUS ranged from 90% to 98%, and the speciﬁcity ranged from 67% to 88%. Meanwhile, the sensitivity of clinical examination ranged from 75% to 95%, and the speciﬁcity ranged from 60% to 84%. 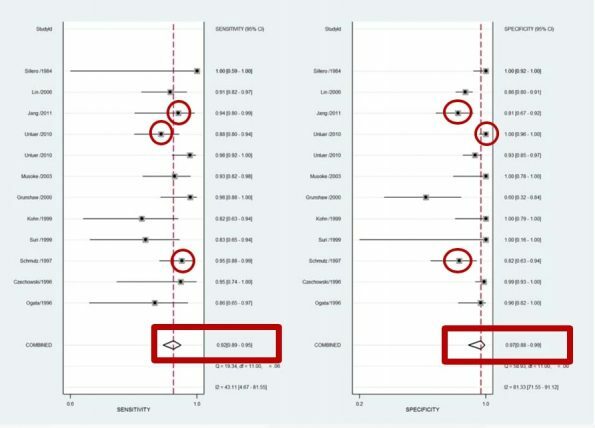 The pooled sensitivities excluded the one trial by Marin et al., with this they found an overall pooled sensitivity and speciﬁcity for POCUS at 97% (95% CI = 94% to 98%) and 83% (95% CI = 75% to 88%), respectively. Regarding the Marin et al. trial, rather than compare CE vs. US, they compared CE vs. CE PLUS US. Interestingly, they also split their cohort up a priori into clinically evident vs. clinically occult abscesses based on an initial assessment. 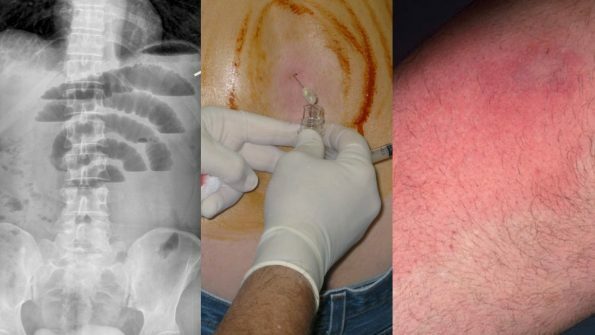 While POCUS did not add much to the accuracy with clinically evident abscesses (top row below), the test characteristics were improved with clinically occult abscesses (bottom row). 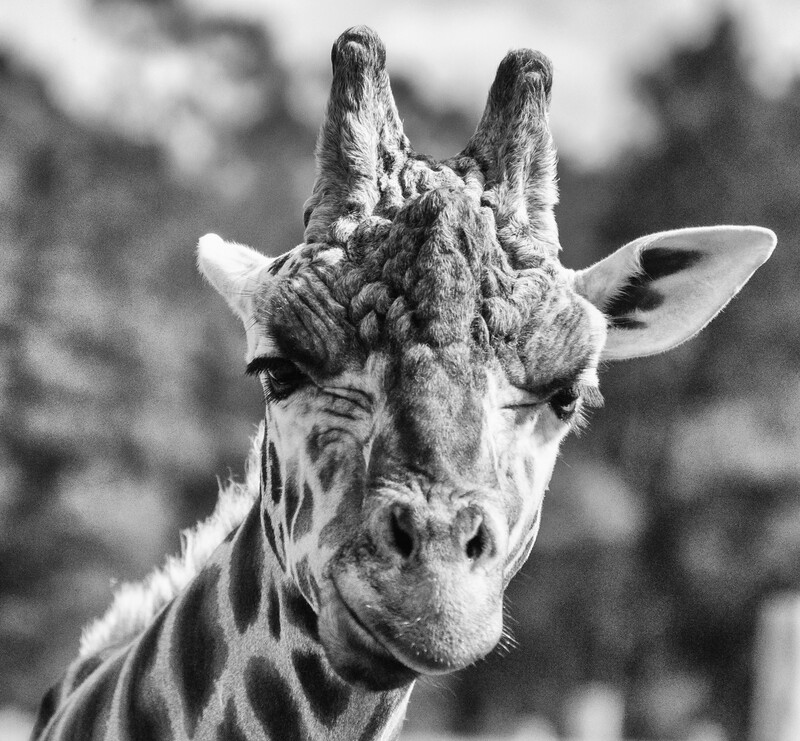 Their conclusion from the meta-analysis was that that POCUS is useful in identifying abscesses and considering the ease of use and lack of radiation or harm, that it should be used liberally in the ED setting. 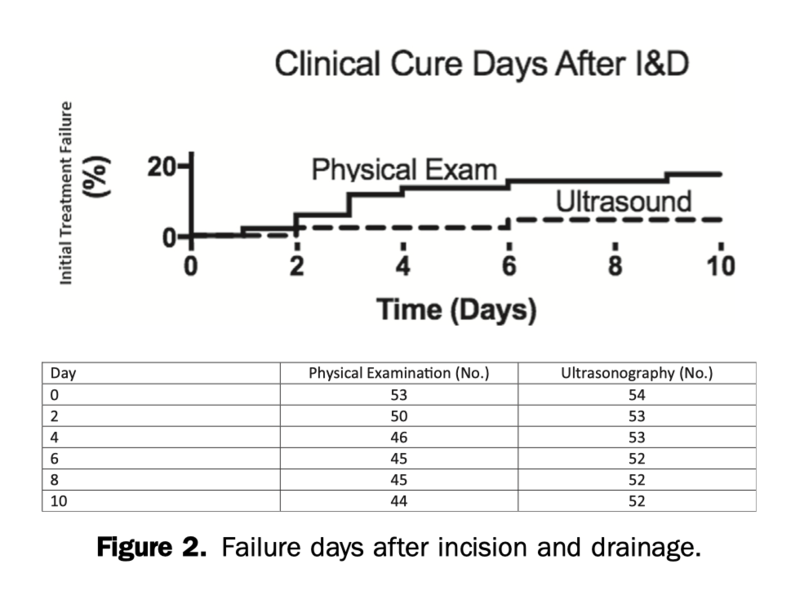 Additionally, POCUS changes management and its addition to CE is likely superior to clinical examination alone especially in clinically occult abscesses. However, it is important to consider: what is the clinical impact of finding these abscesses? Are we just finding smaller abscesses that would do fine without drainage? Are we putting people through an unnecessary procedure because we are finding smaller abscesses? What are the patient-oriented outcomes? Two trials exist looking at clinical outcomes. The first is by Lam et al. published in 2018. It was a prospective multicenter cohort trial looking at 321 patients. Credentialed POCUS users were required to watch a video prior to enrollment. Then, physicians recruited patients in a convenience fashion. Afterward, they defined the two study groups as patients who had POCUS and those that didn’t. They followed up with patients at 7-10 days to assess for treatment failure. Clinical assessment tended to perform better in high certainty cases, whereas POCUS guidance tended to perform better in equivocal cases. But, the rate of treatment failure was NOT signiﬁcantly different between the POCUS and non-POCUS groups. This a bit discouraging. However, groups were defined afterward, this was not an RCT, and the POCUS group had more abscesses which means they were more likely to fail. The other trial looking at patient-centered outcomes is by Gaspari et al. in the January 2019 edition of Annals. They performed a prospective RCT on uncomplicated abscesses requiring I+D. For patients in the POCUS group, POCUS was used before I+D to delineate the size and depth of the abscess and was able to be used throughout the procedure as needed to delineate if the entire abscess was evacuated. The primary outcome was treatment failure (i.e. requiring repeat I+D which produced purulence at 2 days). They found that patients undergoing POCUS were less likely to fail therapy compared with those receiving physical examination alone with a difference between groups of 13.3%. You can see on the Kaplan Meier curve here that clinical failures were much more apparent in the clinical exam group. However, this study was also small and only had only 11 treatment failures. The 95% CI for ARR include 0% as well, so there potentially is no benefit observed here either. In the end, it is difficult to draw a conclusion based on the evidence we have today. It seems that similar to LP, US has little role in the clinically obvious abscess, however, it MAY have a role in reducing clinical failures by delineating whether you have drained the entire abscess or not. Where it does have benefit, likely, is in detecting clinically occult abscesses and has been shown to demonstrate good test characteristics and frequent changes in management. However, this may not translate into an actual patient-oriented benefit as we may just be draining abscesses that don’t need drainage. There needs to be more research in this area to determine what size of abscesses need drainage and which we can watch. We need more robust data on whether or not the influence of POCUS reduces clinical failures. Frasure, S., Hildreth, A., Seethala, R. and Kimberly, H. (2018). 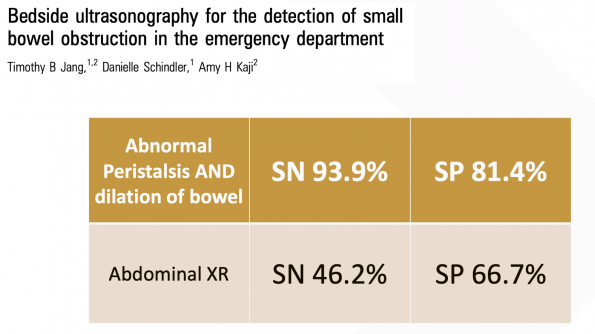 Accuracy of abdominal ultrasound for the diagnosis of small bowel obstruction in the emergency department. World Journal of Emergency Medicine, 9(4), p.267. Jang, T., Schindler, D. and Kaji, A. (2010). Bedside ultrasonography for the detection of small bowel obstruction in the emergency department. Emergency Medicine Journal, 28(8), pp.676-678. Ünlüer, E., Yavaşi, Ö., Eroğlu, O., Yilmaz, C., & Akarca, F. (2010). Ultrasonography by emergency medicine and radiology residents for the diagnosis of small bowel obstruction. European Journal Of Emergency Medicine, 17(5), 260-264. Taylor, M. and Lalani, N. (2013). Adult Small Bowel Obstruction. Academic Emergency Medicine, 20(6), pp.527-544. Gottlieb, M., Peksa, G., Pandurangadu, A., Nakitende, D., Takhar, S. and Seethala, R. (2018). Utilization of ultrasound for the evaluation of small bowel obstruction: A systematic review and meta-analysis. The American Journal of Emergency Medicine, 36(2), pp.234-242. Furness, G., Reilly, M., & Kuchi, S. (2002). 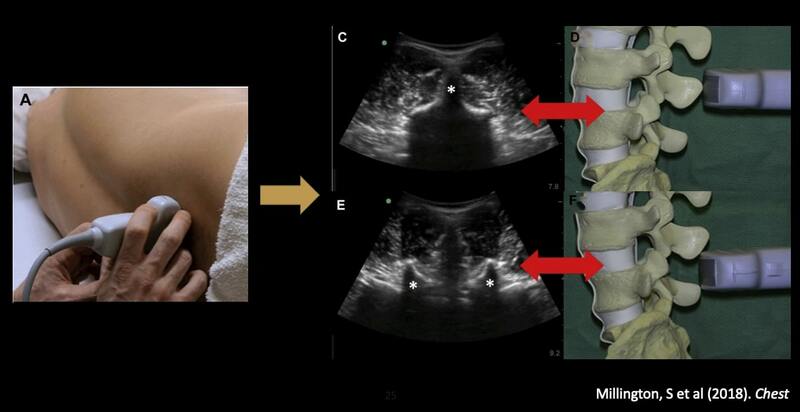 An evaluation of ultrasound imaging for identification of lumbar intervertebral level. Anaesthesia, 57(3), 277-280. Chin KJ, Perlas A, Chan V, Brown-Shreves D, Koshkin A, Vaishnav V. Ultrasound imaging facilitates spinal anesthesia in adults with difﬁcult surface anatomic landmarks. Anesthesiology 2011; 115: 94–101. Moﬁdi M, Mohammadi M, Saidi H, et al. Ultrasound guided lumbar puncture in emergency department: time saving and less complications. J Res Med Sci 2013;18:303–7. Shaikh, F., Brzezinski, J., Alexander, S., Arzola, C., Carvalho, J., Beyene, J., & Sung, L. (2013). Ultrasound imaging for lumbar punctures and epidural catheterisations: systematic review and meta-analysis. BMJ, 346(mar26 1), f1720-f1720. Ferre, R., & Sweeney, T. (2007). Emergency physicians can easily obtain ultrasound images of anatomical landmarks relevant to lumbar puncture. The American Journal Of Emergency Medicine, 25(3), 291-296. Berger T, Garrido F, Green J, Lema PC, Gupta J. Bedside ultrasound performed by novices for the detection of abscess in ED patients with soft tissue infections [published online ahead of print October 24, 2011]. Am J Emerg Med. Marin JR, Dean AJ, Bilker WB, Panebianco NL, Brown NJ, Alpern ER. Emergency ultrasound assisted examination of skin and soft tissue infections in the pediatric emergency department. Acad Emerg Med 2013;20:545–53. Iverson K, Haritos D, Thomas R, et al. 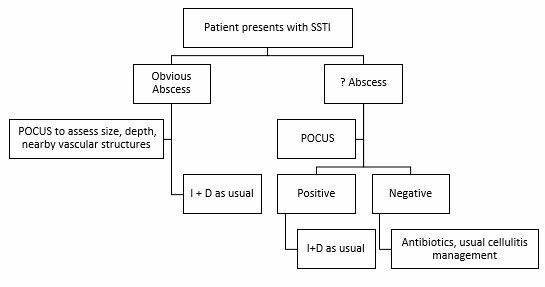 The effect of bedside ultrasound on diagnosis and management of soft tissue infections in a paediatric ED. Am J Emerg Med 2012;30:1347–51. Barbic D, Chenkin J, Cho DD, et al. In patients presenting to the emergency department with skin and soft tissue infections what is the diagnostic accuracy of point-of-care ultrasonography for the diagnosis of abscess compared to the current standard of care? A systematic review and metaanalysis. BMJ Open 2017;7: e013688. Previous Post: Tranexamic acid for hyperacute primary IntraCerebral Haemorrhage (TICH-2): an international randomised, placebo-controlled, phase 3 superiority trial.